Read My Kiss - Kiss Print Readings brings fun and excitement to corporate events of all types and sizes. From formal corporate events to casual mixers, Read My Kiss - Kiss Print Readings are a great addition to any event and is ideal for creating fun, interactive entertainment that attendees can enjoy and will talk about long after your event. Our Kiss Print Readings are an excellent booth attraction at Trade Shows & Expos often creating great crowds and stopping attendees in their tracks with our fun and entertaining presentations and personal readings. Read My Kiss - Kiss Print Readings are an excellent way to deliver your promotional message, conduct lead generation, and directly affiliate your company and brand with a fun and memorable keepsake that will be remembered and referred to over and over again long after your event. Read My Kiss - Kiss Print Readings are also excellent for Hospitality Suites, VIP Gatherings, Receptions, Sales Meetings, Dinner Receptions, Banquets and Spouse/Partner Events. Read My Kiss - Kiss Print Readings entertainment is also ideal for Conferences & Conventions as part of opening ceremonies, cocktail hours, lobby attraction, after dinner entertainment, trainings, orientations, service banquets and both opening or closing ceremonies. Attendeees will be delighted at the inclusion of fun, interactive, personal entertainment. Perfect for scheduled events or casual after-hours events let Read My Kiss - Kiss Print Readings bring the interaction to your Conference or Convention event. Holiday Parties are one of our most popular offerings as guests love the holiday theme, romantic overtones and of course the natural connection with Mistletoe during the Winter Holiday season. Read My Kiss - Kiss Print Readings are the perfect entertainment for smaller office or department get togethers, or larger banquet or dinner parties for the entire company. Management, staff and guests alike will enjoy the festive holiday theme of our Kiss Print Readings. Have you been naughty or nice? What will your kiss prints reveal? 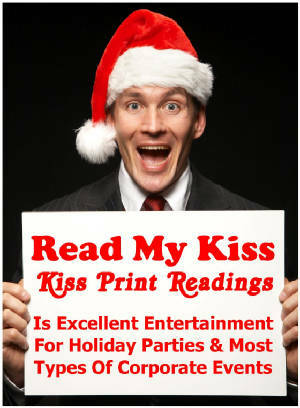 Let Read My Kiss - Kiss Print Readings be the entertainment gift for you holiday celebration. Sales meetings, trainings and corporate events that require education and attention throughout the sessions will enjoy a bit of fun comic relief and a stress-buster as Read My Kiss - Kiss Print Readings are great for playful entertainment relief after a long day of hard work. In between session, before or after dinner or later in the evening social gatherings, let our entertaining readings create the atmosphere of fun and appreciation during your after hours events. Read My Kiss - Kiss Print Readings' universal entertainment appeal make it the perfect entertainment choice for Banquets and Receptions. As guest arrive, during cocktail hour, after dinner or later in the evening entertainment, Read My Kiss - Kiss Print Readings can be presented at any point during your event to be an excellent addition to your festivities. Hospitality Suite entertainment is an excellent environment for Read My Kiss - Kiss Print Readings. We present an excellent and unique entertaining attraction for your special guests in an atmosphere that is both professional and personable at the same time. This intimate setting allows for personal interaction and attention as guest love to learn about themselves through the messages offered by their own kiss prints. Casual, informal events such as Company Picnics are a fantastic performance environment for Read My Kiss - Kiss Print Readings. Your guests and their families will enjoy our unique entertainment as Read My Kiss - Kiss Print Readings are enjoyed by everyone from tweens and teens to senior citizens. Our special keesakes are the perfect addition to our personal readings allowing your attendees to share their readings for fun comparisons and are suitable for framing after your event.